Join us for a night under the stars on the Bryant Park Grill Rooftop featuring live entertainment by City of the Sun and a dazzling shoe art masterpiece by Reneé Snelson in addition to great food and cocktails. Your ticket purchase and support of this event will support ShoesThatFit.org, helping children in need of footwear in thousands of schools across America. Meet upcoming talent in the footwear industry! The 3rd annual presentation to the footwear design student winner of the Joseph C. Moore scholarship award to attend the Arsutoria School in Milan, Italy. A special thank you to contributing sponsor: Footwear Distributors & Retailers of America - FDRA.org. 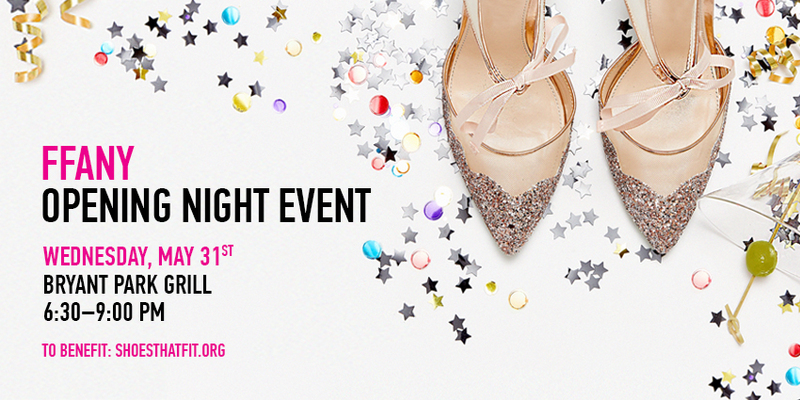 For questions, please email: Party@ffany.org or call 212.751.6422 x. 10. Ticket purchase and attendance is open to FFANY members, participating footwear and related industry trade attendees only.